You can get to know a city pretty well as a tourist if you visit it enough, but to truly absorb the vibe of a place you have to feel what an authentic daily commute there is like. You may think you're hanging in the most beautiful, idyllic locale on Earth, but until you've endured a full month of interminable sweaty and expensive bus, train, and car rides to and from work, you'll never fully understand what its like. To help you better understand what it's like for nine-to-fivers around the world, a new study ranked some of the most popular cities on earth based on how bad (or good) their average commutes are. This enlightening intel comes from the folks at Expert Market, who crunched the numbers on a whole slew of relevant data to figure out just how rough the daily slog to and from the office compares in 74 "hotspots" with 300,000 or more residents in 16 countries. Specifically, they looked at seven different metrics for each including the average time spent commuting each day, average daily wait time for a bus/train, average journey distance (one way), and the percentage of commuters who must make at least one change as part of their trek (e.g., transfer). They also looked at the average cost of a monthly travel card as a percentage of the average monthly salary in a given place, and the average number of hours spent in congestion while commuting per year. In other words, they were very thorough. Topping the list of cities with the worst commutes is Rio de Janeiro, followed by Bogota, and then Sao Paulo. As for where you can expect the "best" commute, Nice, France is number one, followed by Cuenca, Ecuador and then Bilbao, Spain. The full ranking's right here, but this is how things shook out at the top and bottom of the list. 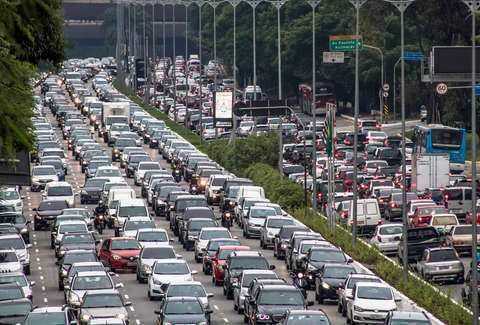 You'll notice six of the cities with the worst commutes on the planet are in Brazil, a country where cost of travel, wait times, and commuting distance are all among the highest of all the surveyed cities. Alternately, commutes in Italy and France are among the most chill. As for how things compare in the States, San Diego earned the distinction as having the best commute of all the 11 US cities that were considered in the ranking, while Miami has the worst. And while only one American city cracked the top ten worst list, it's worth noting that commuting drivers in both New York and LA spend more time stuck in traffic than those in Sao Paulo or Bogota. But hey, why even worry about rough commutes when we'll all just be jetting around in flying Ubers in a few years anyway?